While I bake quite often, I hardly ever make cupcakes. 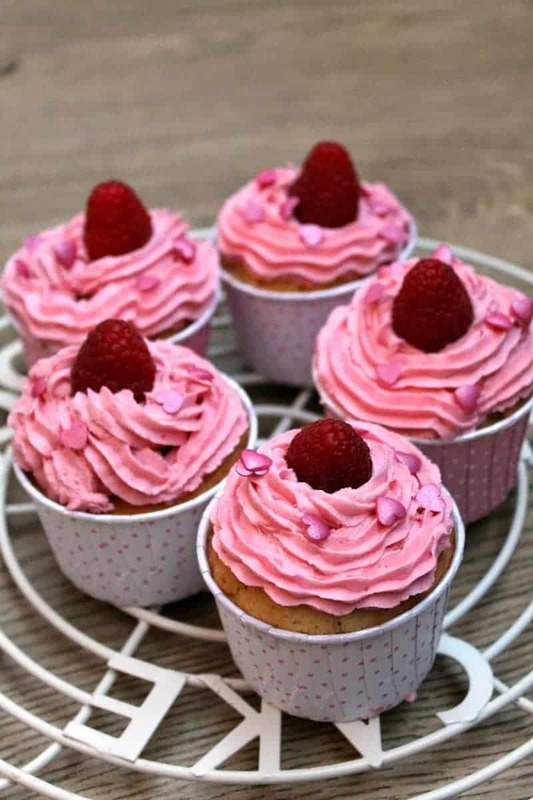 My children love them as a treat though of course, so I thought I’d make some vanilla cupcakes with raspberry buttercream, which would also be great for Valentine’s Day. The buttercream is made from fresh raspberries, and I used a quick and easy method to make them into raspberry purée. Read on to find out how to do it! These paper baking cups are so cute and if you use them you don’t even need a muffin/cupcake tray, plus you have no tray to wash up. That’s definitely a win-win situation! Simply pipe your buttercream icing, add a fresh raspberry on top and some heart-shaped sprinkles and you’re ready to go. 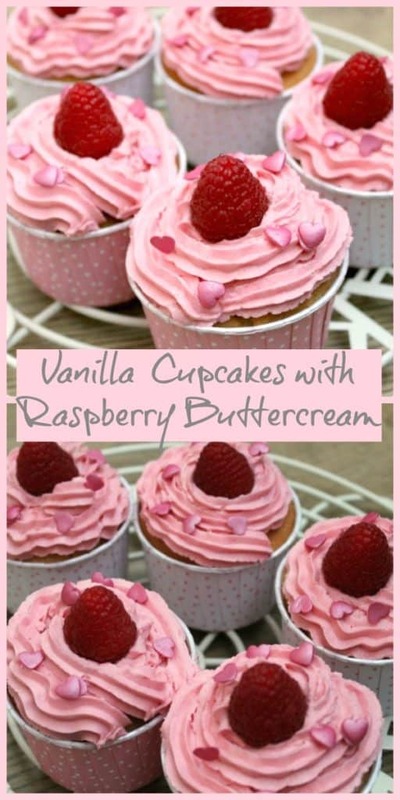 The fresh raspberry adds a lovely colour and flavour to your buttercream, and not a food colour in sight here. 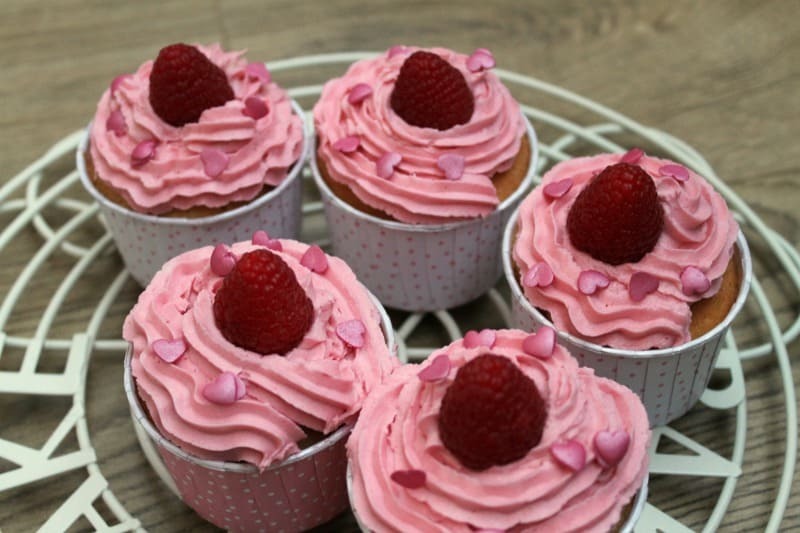 Since the buttercream already contains sugar, I kept my raspberry purée unsweetened, and it adds a lovely tang of that fresh raspberry flavour to your cupcakes. Cream the butter with the sugar and then mix in the eggs, flour and milk and vanilla extract. Bake at 170 degrees for 15-20 minutes or until baked through and golden. Mash the raspberries with a fork and then push through a sieve to deseed. Microwave the raspberry puree on high for one minutes at a time, stirring between each time, for 2-3 minutes in total, so it reduces and thickens. Leave to cool. Meanwhile, beat together the softened butter and icing sugar to make your buttercream. Stir in the cooled raspberry puree to the buttercream and make sure it is mixed in thoroughly. 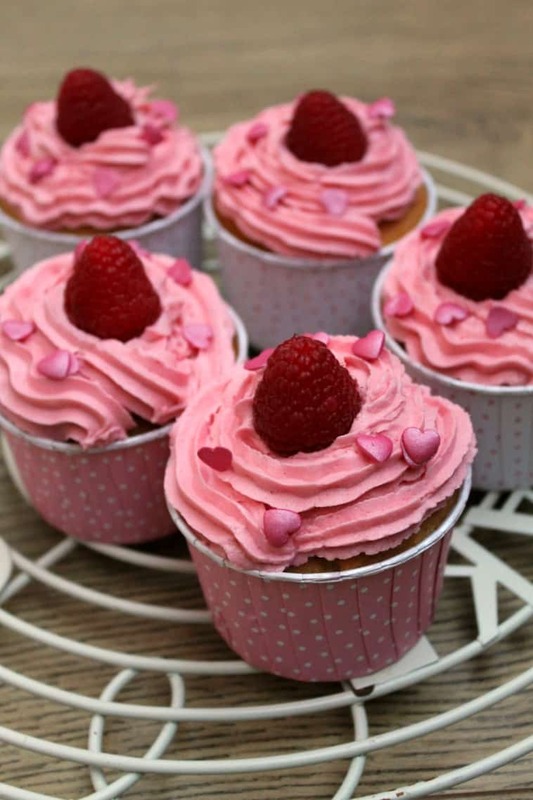 Once your cupcakes have cooled completely, pipe swirls of buttercream, finish with a raspberry on top and heart sprinkles. I’m wanting to make this raspberry buttercream To fill a drip cake, it won’t have fondant just buttercream covered. Does it need to be stored in the fridge? These lovely little cakes look very enticing. You call them ‘Vanilla’ cupcakes but I don’t see any vanilla in your recipe. How much and what type i.e. Extract, vanilla bean seeds or Paste? These cupcakes are gorgeous! The colour is stunning, so does the complete decoration! Simply love them! They look so lovely! I’m sure that buttercream tastes amazing as it looks, well done!! thanks Andrea, it tasted sooo good! 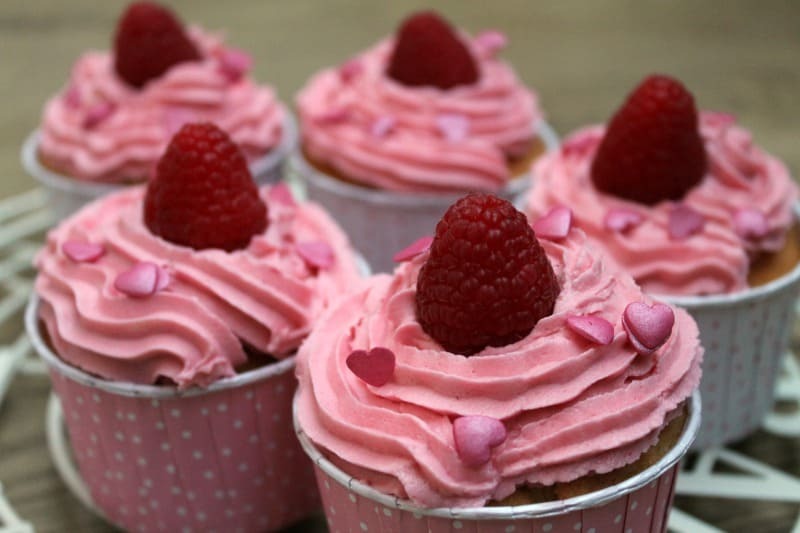 Love that buttercream – the fresh raspberries must make it taste amazing. I need to pop over to yours so that I can learn how to pipe like yours. Those look gorgeous! Such a beautiful colour. I’m not usually a fan of cupcakes, but I am feeling very tempted right now!